Susanthika to train in Melbourne? Susanthika Jayasinghe’s decision to train in Melbourne at the Kathy Freeman Camp has set off speculations that she may decide to adopt Australia as her native land. 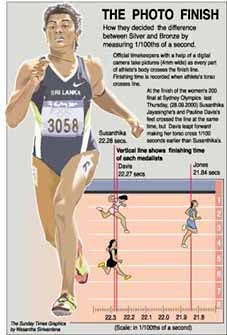 If that happens we are bound see Susanthika run for Australia at the next Olympic Games to be held in Athens in 2004. A top Sri Lankan official, who is held in high esteem, who did not want to be quoted said that it is best that Susanthika remains quiet as hints are passed at her. “Several were trying to provoke her and make her lose her confidence. This did not work”, pointed out this official. Susanthika supported by her athletic coach Tony Campbell did not rise to the bait. She kept a cool head and then at the final 200 metres dash, she gave off her best, which in reality should have brought her silver. Unfortunately she lost by a hundredth of a second to Jamaica’s Pauline Davis. Marion Jones of the USA was the winner. Questions have risen as to why Damayanthi Darsha, the Asian Games record holder did not face the starter. Before the Sri Lanka team left for the Olympics officials spoke of Darsha as a prospective medal winner. Susanthika was not in the Olympic Village. Several messages to contact her were not answered. It was later said that Susanthika had left the Olympic Village with her American coach. This was expected as Susanthika always had a fear for the food she ate and the water she drank. At the National Sports Festival held at the Sugathadasa Stadium before the Olympics, Susanthika gave her food and water for safekeeping to her parents who were in the grandstand, as she did not trust anyone else. Susanthika was also told that she would not be permitted to run in the Olympics if she does not take part in the National Games. Meanwhile Australia increased their gold medals tally on the penultimate, China were second followed by Russia, Australia and France yesterday. Outstanding among the performers was Cuban boxer Felix Savon, who won his third consecutive gold medal, this time fighting in the 91 KG. He outpointed his Russian opponent thus joining the feats of Cuban idol Teoflo Stevenson and the great Hungarian Laszio Papp. Cameroon too won their first gold medal defeating Spain in the football final played at noon at the main Olympic Stadium at Homebush, watched by a record crowd in a penalty shoot -out by 5 goals to 4. The scores were deadlocked at 2 all at full time, with Spain leading 2 nil at half time. Chile took the bronze defeating USA. In the Individual cycling time trials, Viacheslav Ekimov of Russia won the gold for with Jan Ullrich taking the silver for Germany and Lance Armstrong the bronze for USA, while the women’s gold was won by Leontien Zijlaard of Russia. Mari Holden the silver and Jeannie Longo Ciprelli of France the bronze followed him. Cuba pulled a good win over Russia in a five setter to win their third consecutive gold with Brazil taking the bronze over USA. Marion Jones failed to win the fourth gold of the promised 5, taking the bronze in the long jump and the 4X 1OO metres relay. Australia helped by a hat-trick by Troy Elder beat Pakistan 6-3 to win the bronze in hockey, the only redeeming feature was that Pakistan came back into contention of being the Asian great by taking sixth spot. SYDNEY, Sept 30 (Reuters) - Sprint champion Maurice Greene collected his second gold of the Sydney Olympics on Saturday when the United States won the men’s 4x100 metres relay. Greene, who won the 100 metres individual title a week ago, anchored the American quartet to a time of 37.61 seconds, the fastest time this year, beating Brazil (37.90) and Cuba (38.04). The 26-year-old world champion received the baton level with the Brazilians but pulled away in the final leg. The Sri Lanka billiards and snooker Association team led by national champion K.H. Sirisoma once again displayed their prowess when they beat Tamil Nadu in the second billiards and snooker Test at the Kandy Garden Club on Friday. Lanka are currently leading the three Test series 1-0 with a win in the inaugural first Terst played at the Grand Hotel, Nuwara Eliya. Sirisoma and his team will now come to Colombo for the final Test commencing at 10 a.m. today at the Galle Face Hotel.